Change settings & withdraw commissions. Member Contributionswhat is working for you? Enter the email or username you use to sign in, and we'll send you an email with login instructions. The FunMouse spelling utility makes it easy to perform spell checks in any windows application, even if the application has no spell check support. To minimize the FunMouse setup file, no dictionary files are installed when FunMouse is first installed. These dictionary files have to be downloaded separately. Users will have to download the main dictionary support files. They can also choose to download dictionary support files for an alternative language. The main dictionary support files are for the the United Kingdom English dictionary. These support files not only performs spell checking on words, phrases and paragraphs, but also includes word definitions, a thesaurus and synonyms which means users can select any word in the spell check window, even if it is spelled correctly and get a definition for the word as well as options to change to another word with a similar meaning. The thesaurus, word definitions and synonyms are only available for the main dictionary. All other dictionaries only have spell check support. 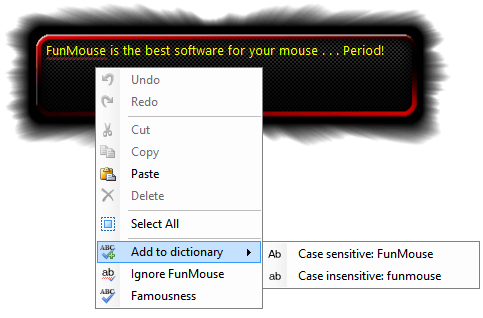 The FunMouse spell check utility can be accessed from the selection tools pop-up window that appears when a users selects text in any window or if they double-click a word to select it. Clicking the download link will then take users to the FunMouse download page from where they can choose which support files to download. If a user has downloaded the main support files as well as the support files for an alternative language, they can easily switch between languages by simply holding the left mouse button pressed in till the color of the text in the window changes. For ease of use, if you switched to the alternate language dictionary, FunMouse will continue to use the alternate dictionary every time you access the spell check utility till such time as you change it back to the main dictionary. While support files for multiple languages can be downloaded from the FunMouse website, only one alternate language dictionary can be installed at a time.